If you want to the control the planet and everyone on it - read this book. If you get upset and have a hard time stabalizing your emotions - read this book. If you have repetitive thoughts and don't know how to get them to stop - read this book. This book addressed many of the issues that I had. Dr. Glasser takes us through several relationships that we all have in our life (parent-child, teacher-child, manager-employee, spouses, friends...) and how we can improve them by only focusing on changing ourselves and not everyone else. When I gave up trying to control everyone else and every situation, life became relaxed. When I had thoughts or interactions that were upsetting, I shifted my focus to positive or more productive thoughts and I found myself recovering from these scenarios quickly. Parts of the book were dry but overall it was good (and helpful) reading. I wanted to skip over the child relationships since I don't have kids, but I read it anyway and found that it helped me to understand my nieces and nephews. It also helped me to understand what some of my friends with kids go through. I highly recommend this book - it can improve your life! Was impressed by your review of this book. My self-category is not until August but I will defenitely keep this one in mind. It isn't so much that I want to control everything (maybe a tiny bit) but it's the mind racing thing and the worrying about everything that I have a problem with. I need to shift my focus a bit. Choice Theory: A New Psychology of Personal Freedom: Choosing the life you want to live and staying close to the people you need, William Glasser, M.D. Keep in mind that this review is from a [previously] self-titled, "non self help book person." I also went in skeptical ... I just did not believe anything could be as helpful as Patty kept claiming it was (virtually every time I said, eek, I need help with ___ fill in the blank). It's one of the best times I can remember being wrong. This is one of the best books I have ever read and if books can be valued on how they make a life better, or enrich it, emotionally (as well as spiritually, then in turn physically), this would be number one, in my life thus far. I realize that is a profound statement, but I don't know else to put it. 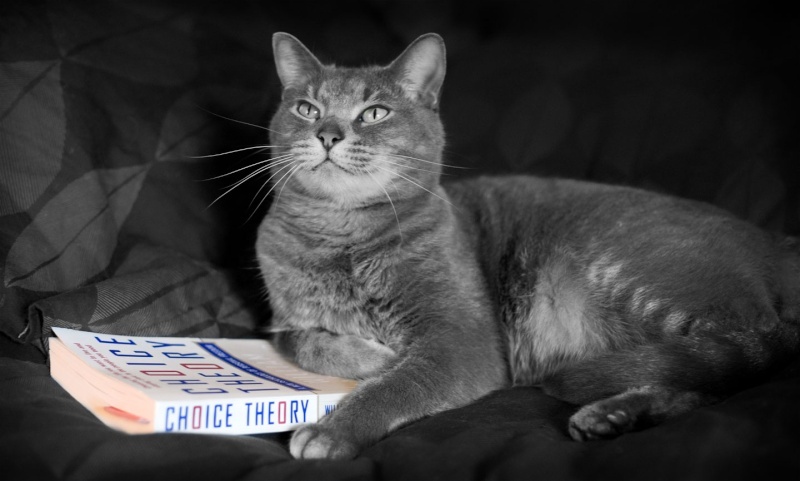 Choice Theory is, in essence, a psychology for "new freedom" as the title suggests. It teaches us how the punitive, externally controlling behaviors are destroying so many of our relationships, e.g., marriage/partner, parent/child. Dr. Glasser claims that almost all psychological problems we have are "relationship problems." At its core, the psychology's foundation is based on one simple underlying concept: You can only control your own life. The freedom comes in as Dr. Glasser shows us exactly how to do that. I will not paraphrase any more of the psychology, tools or solutions because that would do it an injustice. This book must be read by the individual and experienced by the individual. Some will embrace it, some will probably not, but I can only say that I personally found an immense amount of peace, freedom, acceptance and hope for all the relationships I have and want to keep in my quality world. The part I loved the best was learning about how we are all driven by five genetic needs: survival, love and belonging, power, freedom and fun. As individuals, these vary in us all, but he shows us how to bring harmony (and be responsible for ourselves and not control our partner/parent/child to meet our needs, wants, fears, etc. - because it does not work anyway and generally causes the opposite of what we would like to happen, even cause severe damage) to relationships through something called a "solving circle." It was so interesting, to the point where I learned an enormous amount about myself ~ and really actually look forward to putting it into action wherever life takes me, in my relationships with family, friends and lovers. I now know how not to control another human being and just as importantly, how not to BE controlled by another person. He is HUGE on "choices" ... accepting the ones we have made; and making better ones ... and how it is surprising how most of what we do in regards to a reationship IS a choice, e.g., everything from choosing to depress, sit in pain, sadness, misery, anger, control another, punish another, etc. After reading this, I very quickly recognized some of my bad choices and thought, wow, that surely was not effective in my life, I'm going to make better ones from here on out. The other part of the psychology I found help with, which I had looked for but had not yet found prior, was letting go, accepting and putting good choices into place for dealing with past harms/problems/issues. That was a true Godsend, a lifesaver. So if you are looking for a way to live consciously, embrace better choices and improve virtually all of your chosen relationships, you will love this book and the psychology behind it. If you are looking to let go of some past damage, I believe this will help virtually anyone. There are even many "Choice Therapy" therapists who help clients put this into practice in the real world, if someone is having difficulty. I don't generally like to be one of those book-thumper people who says "everyone should read this book." But that said, everyone should read this book. The final chapters are devoted to the author's vision on how, if we all used this simple (and very kind) psychology, how much better our world, and communities, would be ... and he shows astounding proof, from prisons, to court-mandated counseling for abusive relationships, in schools and in love relationships that all of us can relate to. So to help something so positive, and healing, catch on, I'm gonna do my bit: read it I really think you'll be glad you did. This is my choice for Less Than Perfect category for August. I was looking forward to reading it since I read Patty's review. Then after reading Carolyn's review I knew it would be my CHOICE. Just finished reading this book (my Less Than Perfect Category for August). I had a little problem reading it at the beginning (first chapter) but liked it after that. I found that I actually have been practicing choice theory in recent years of my life without even knowing it. It's like once you get it- your life will be so much better for it. I like that he keeps stressing that only you can change your own life and that you can't change anyone else. I always felt that if everyone was responsible for themselves, how much better our society would be. If you choose to read this book, I would suggest you read all the chapters, even if you think they to not apply to you. Doing so will be very informative and might make you remember situations when you were a child or teenager. I'm sure everyone will see themselves or someone they know in all the different chapters.